I am back from my holiday now so I am able to post again. I thought I'd come back with a skincare review. This is Boot's own brand, Botanics. If you don't already know, the Botanics range uses natural plants as ingredients. 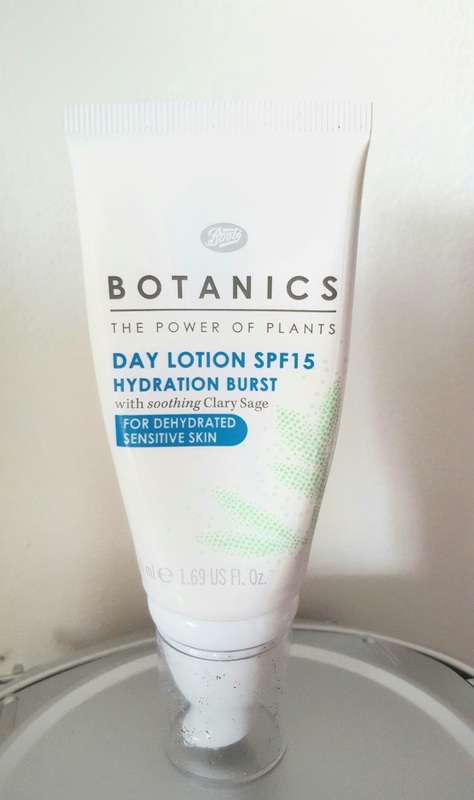 The Botanics Hydration Burst Day Lotion SPF15 has soothing clary sage and is designed for sensitive and dehydrated skin. It has SPF15 UVA and UVB and it claims to have 8 hours of hydration which is typically how much time we can spend out in the day. In addition the packaging has a pump which I like as it makes it simple to use. The bottle contains 50ml of product which makes it good for travelling due to it fitting under the 100ml mark. I bought this for going abroad as I needed a moisturiser with SPF that will protect my sensitive skin without giving me an allergic reaction. I have taken this on a 2 week interrailing adventure as well as a week in Tenerife and there is still plenty left so there is more than enough product! Another skin worry is that I am also acne prone and I get afraid the SPF will break me out. Fortunately, this moisturiser didn't seem to break me out or clog my pores. I found that I could use this moisturiser alone and under make up. It sat fine underneath make up and didn't make my skin look greasy or shiny when I was wearing no make up. When out in the sun I would reapply the moisturiser on areas where I am most likely to burn, such as my nose, every 2 and a half hours. Because of this moisturiser my face never burned on any of my trips abroad which I am grateful for! Because there's nothing like a nose for a Rudolph the Red Nose Reindeer. Unfortunately that is it for my positive words about this moisturiser. There were certainly things I did not like about it. For starters, the lid is so annoying! The lid constantly comes off whether it is in my make up bag, my handbag or what. The lid just does not stay on and I was frequently losing it and having to find it. But the most annoying thing about the moisturiser was that it stung my eyes like crazy! It didn't matter that I didn't apply moisturiser near my eyes: it stung. Whether I was walking around as normal, got my face wet or I sweated, the moisturiser would always somehow end up irritating my eyes and they would sting for a good hour. My eyes would stream like crazy and sometimes they'd even go all puffy. I could rinse my eyes out with water and clean them with tissue but the problem still persists. After looking at the product on the Boots website I have seen that I am not the only person with sensitive skin that this has happened to! This product says it is for sensitive skin yet affects my eyes like no moisturiser ever has. Last of all whilst I was using this I was getting dry patches of skin appear on my face which leads me to think it is perhaps not that moisturising. Because of how much it stings and makes my eyes water, I will not be purchasing this again. At £5.33 it is a decent price for a SPF moisturiser on a budget but I cannot cope with how much it hurts my eyes. I put up with it for the time that I was travelling but now it is time to let it go. Even though it says for sensitive skin, if you have sensitive skin I do warn you: proceed with caution! Do you like anything from the Botanics range?